The last few months have been hectic, what with recording and releasing the first Djinn & Miskatonic album, and I have a number of album reviews pending. I’m going to do a few shorter, but hopefully equally useful reviews until I’ve caught up with the backlog. Gotherburg crust/sludgers Agrimonia’s sophomore effort, ‘Host of the Winged’ was one of the most dense and relentlessly intense releases in this space in 2010. Particularly with the modern US sludge scene dwindling away on the trail of accessibility, it’s heartening to see that, on ‘Rites of Separation’, Agrimonia continue to practice the art of adding melody and expansiveness to their sound without compromising on the sheer weight of negativity their tutelary genres are supposed to embody. Christina’s vocals are harsh litanies of acrimony, guitarists Pontus (also in the excellent OSDM band Miasmal) and Magnus unleash a range of six-string-soundscapes that maintain the pressure while exploring almost post-metal like whorls and tides of sound and melody. The 5 songs here are all generally of epic length, and the layered, lush yet corrosive sound is augmented by thoughtfully positioned keyboard layers contributed by Christina. She even contributes gentle piano lines – piano on a crusty sludge record! – which only add another element of contrast and cohesion to Agrimonia’s arsenal. Martin’s bass work is especially effective at bringing in dolorous, droning undercurrents in the more introspective sections and Bjorn, who also plays for Miasmal, anchors the sound with his incisive, dynamic drum work. This one is up there with Kongh’s ‘Sole Creation’ and Primitive Man’s ‘Scorn’ as one of the most crushingly massive releases of the year from the sludgier side of the tracks, but that heaviness is only furthered by the moments of melodic reflectiveness that are interspersed throughout the album. The band’s stated genre is doom/thrash and I was curious to see how they would make that work. Mainly they’ve taken the crunch of thrash and some of its more mid-tempo aspects and melded it to a histrionic, melodic, traditional doom framework. This isn’t miles away from how Trouble (which is bassist Ron Holzner’s alma mater, after all) always brought the doom without being overtaken by the pace and energy of their coevals in the thrash scene – nothing here will be mistaken for an Exodus outtake. Instead we have songs that are long on melody, augmented by generous lashings of violin, and can move from moody, slow passages to 8th-note grooves with pounding drums and chugging power chord riffs. The band’s musicianship is top-notch but I found the vocals a shade too grungy at times, which is a shame because Mark Weiner does a mean Eric Wagner when the mood catches him, such as on the magnificent ‘Tilted World’. Violinist Rachel Barton Pine’s contributions go well beyond simple layering or novelty interludes, perfectly meshing with the seasoned doom-mongering of the rest of the band. The end result is a sound that makes the band a natural addition to the front row of classic American doom bands. Certainly, their decision to include two classic doom covers in their debut offering (a great version of ‘Burning A Sinner’ which makes the Witchfinder General sound more like Trouble and a cover of Pentagram’s ‘Relentless’ which sees Weiner apparently channeling the vocal stylings of Wino) shows how closely this band identifies with the history of the doom genre, but doesn’t capture the variety and lush romanticism of the music on offer here, which isn’t just limited to retreading what has gone before. Kraut is alive, and it’s got shoes. While Samsara Blues Experiment purveys the darker end of the modern kraut spectrum, their scene-mates and countrymen, Suns Of Thyme have a more airy sound, less grueling, more filigreed and bright-eyed. There is a sense of wide-open spaces and endless, ecstatic jamming in these songs, but there is also a certain serene contemplativeness underlying the psychedelic excursions. These songs are also decidedly concise, with running times in the 3-4 minute range most of the time. It’s kraut crossed with shoegaze: shimmering guitars, motorik jams and hazy vocals intertwining to form a dreamlike, propulsive sound. Everything here, especially the voice, sounds like it has been slathered in layers of glistening star-stuff (not to mention delay), and while individual songs do not jump out at you on initial listens, there are enough way-out bits and shimmering, melodic passages to make this album a pleasant excursion down the river of Lethe, the sonic equivalent of a kaleidoscope held to the eyes on a warm summer afternoon. And that’s it from me for now – stay tuned for a couple more catch-up posts this week! With the rest of the (active)writers on board, we’ve decided to put up our own little mid year best-of lists. Hopeful to the fact, that you guys might stumble on something new in the process as well. We had Mohammad Kabeer’s list posted last week, check that if you haven’t already. Today we have our own doomlord Jayaprakash Satyamurthy, talking about his favorite ones. I greatly prefer this album to the last Pentagram offering; the best bits on it were Griffin’s solos, anyway. A soulful, heavy and integral collection of excellent tunes by a consummate songwriter and guitar player. What some of the latter-day trad doom bands forget is that their influences always turned in albums that were as diverse as they were definitive. Goatess understands this, and each song has its own character while maintaining a consistent feel. Chritus, of course, is in fine form. 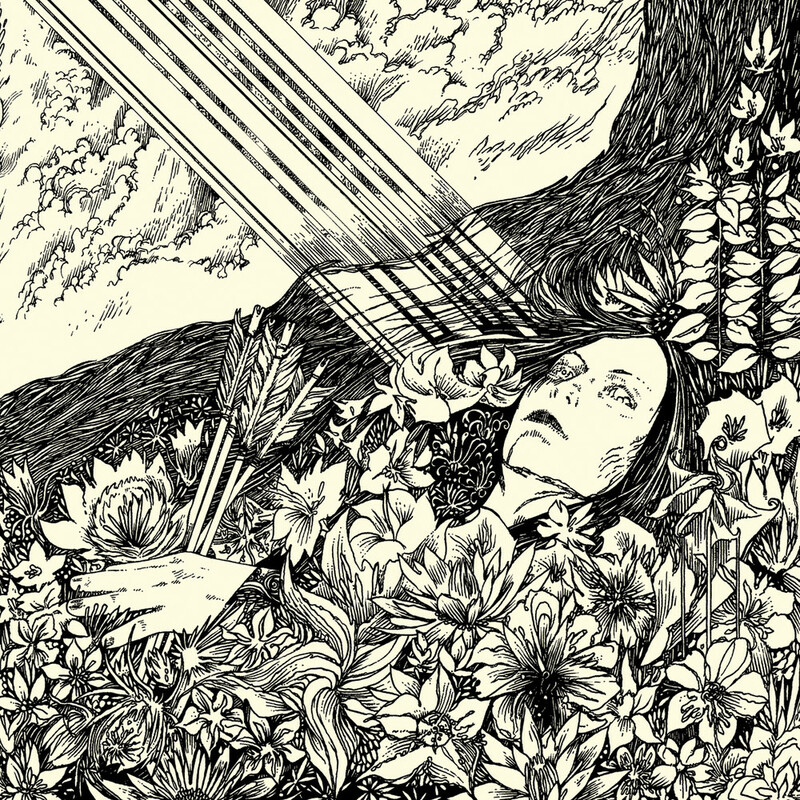 Just four songs, but each one is a sprawling epic of heavy, sludgy guitars, mesmerizing, almost post-metallic textures and a great mix of gruff and melodic vocals that don’t sound gimmicky at all. Abrasive, grimy, downtempo and heavy as heck, the Colorado sludgers’ debut album is one of the finest slabs of dissonant, pissed off riff abuse in a while. A fantastic production job abets songs that emerge and fade in squalls of noise while providing a surprisingly healthy quota of genuine hooks in between. This is blues rock the way it’s rarely heard – not an effervescent virtuoso showcase, but a series of strung-out, stoned jams that reverberate with washes of glorious fuzz, oddball storylines and eccentric but very authentically bluesy ritualism. Imagine a slowed-down Portal. That begins to describe this UK black/doom band’s sluggish, weighty sound. The ambience is nightmarishly oppressive and the structures are more abstract and free-form than on their debut, ‘Denouement’, which only works in favour of the uncanny atmosphere conjured up by this band. Not an album as much as a ritual, a trance-inducing, terrifying, alluring song-cycle that takes you through a stunning diversity of musical textures. Their best album yet. The band with the Sleep-worshipping name delivers a doom/sludge album that doesn’t wear any of the expected influences on its sleeve, choosing instead to revel in some of the most original and distinctive riffs and melodies I’ve head being carved out in this genre in a while. Intelligent, questing and melodic progressive extreme metal with an introspective bent. One of the best debuts of the year and certainly the best Indian metal release of the year so far. This Peruvian doom band has fallen beneath the radar for me in past years, but this platter of seasoned, immersive music ensures that I’ll pay them a lot more attention henceforth. Dark, mystical music with great tone and songs that stretch out to great effect. Not their finest hour, but a wonderfully doomy set of songs. 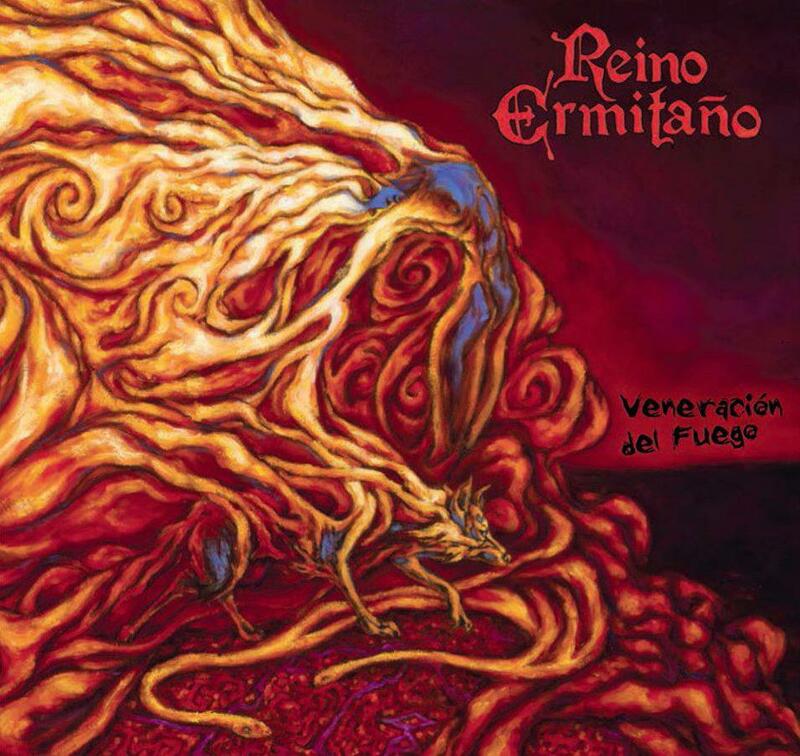 Jayaprakash Satyamurthy reviews the new album from Reino Ermitaño titled Veneración del Fuego , released via I Hate Records. Pre-dating the recent trend of female-fronted doom bands by a decade, Peru’s Reino Ermitano have been flying the flag of fuzzy, riff-driven, mystical doom metal since their formation in 2001. I am not familiar with their back catalogue, having only heard their sophomore release, ‘Brujas del Mar’, so I wasn’t sure what to expect when I loaded their new CD into my player. First of all, there’s the guitar tone – thick, heavy and with a satisfying backwash of fuzz. The bass tone is more glassy than I favour for doom, but blends nicely with the guitar. The drums aren’t a standout element, but they get the job done. The riffing clearly draws from traditional doom motherlodes – some Cathedral, traces of Saint Vitus and Pentagram, a dose of Wino worship, and a general atmosphere of lugubrious, mystical ritual. Need I mention that there’s some Sabbath in the mix? The vocals are sonorous, haunting, somewhat straightforward but very effective. The fact that I don’t understand the language the lyrics are penned in perhaps adds a touch of exotic mystery to the whole production, although it is not too hard to piece together the meanings of things like the album title or song titles like ‘Quimera’, ‘El Rito’ or ‘Sangre India’. Or maybe it’s just that I’ve watched a lot of horror films from South American countries. The songs here tend towards the drawn-out, with an average running length of around 7 minutes, but they never feel excessive. While the feel is pretty constant from start to finish, and the band doesn’t indulge in shifts for their own sake, there are enough distinctive and memorable sections sequences into each track to keep it interesting. The band strikes a happy balance between the sense of iterative stasis that is so crucial to true doom music and the dynamism without which that music can become a mere exercise in funereal texture with no real tension or allure. And solos of the quality and length of the one that stabs in around the 7-minute mark in ‘Quimera’ ensure that there is a payoff for the listened who has weathered the tectonic drift of Reino Ermitano’s songs. Other standout moments are the keening, droning guitar textures on ‘El Sueño del Condor’, reminiscent of the more atmospheric expanses of certain death metal bands, when they slow it down, the swirling, Candlemass-goes-to-NOLA riff that opens ‘Desangrándote’, the elegiac violin solo on ‘Cuando la Luz te Encuentre’, or the epic ‘Sangre India’. This one deserves to make it to more than a few best doom of the year lists. A strong, dynamic offering from a band that has honed its craft and is sure of the musical statement it is making. Jayaprakash Satyamurthy reviews the new album from Jex Thoth titled Blood Moon Rise, released via I Hate Records. In the time since their debut release, Jex Thoth’s entire line-up has changed, save for the eponymous frontwoman. Despite this, there’s a remarkable continuity style in their releases, hinting at Jex’s total dominance over the band’s sound. Lush, mellow and haunting soundscapes, sinuous, melodic guitar lines and a certain folksy, ritualistic vibe – all the same elements are in place, and looming large over all of them is that voice, surely one of the finest in the whole female-fronted doom/occult rock scene. Personally, I find Jex Thoth’s sound just a bit lacking in edge – I prefer her Sabbath Assembly project – but there’s no denying that this album is a fine collection of songs. To my ears, it lacks something in the quality of the individual songs, with nothing approaching the majesty of ‘Warrior Woman’ or the sprawl of the Equinox Suite, highlights of the debut album. Indeed, the first two tracks seem to flash by before they have time to fully develop, and this seems to be the case again with a later song, ‘The Four Of Us Are Dying’. The ominous strains of ‘The Divide’ are a highlight with its keening organ and ultra-doomy guitars. ‘Keep Your Weeds’ is another stand out, with a mesmerizing vocal and gorgeous interwoven guitar and organ lines. ‘Ehja’ is possibly the centerpiece of the album, an extended, traditional doom-influenced track that provides Jex with ample space to weave her shadowed tales. ‘Psyar’, another epic track, closes out the album. Its overall atmosphere is mysterious, velvety and darkly inviting, with an epic guitar solo, yet somehow the specifics feel a bit too static, a little lacking in granularity, and that’s the charge I’d level against the whole album. It’s superb mood music, great for lulling yourself into a sort of psychedelic-spacey-paganistic trance, but there aren’t enough memorable tunes or stand-out instrumental passages. It’s a fantastic backdrop, but the details often don’t really resolve on close scrutiny. It’s still a fine album for what it is, of course and might even be one of your favorites of the year if you’re not looking for what it doesn’t offer and are into all the many pleasures it does contain. 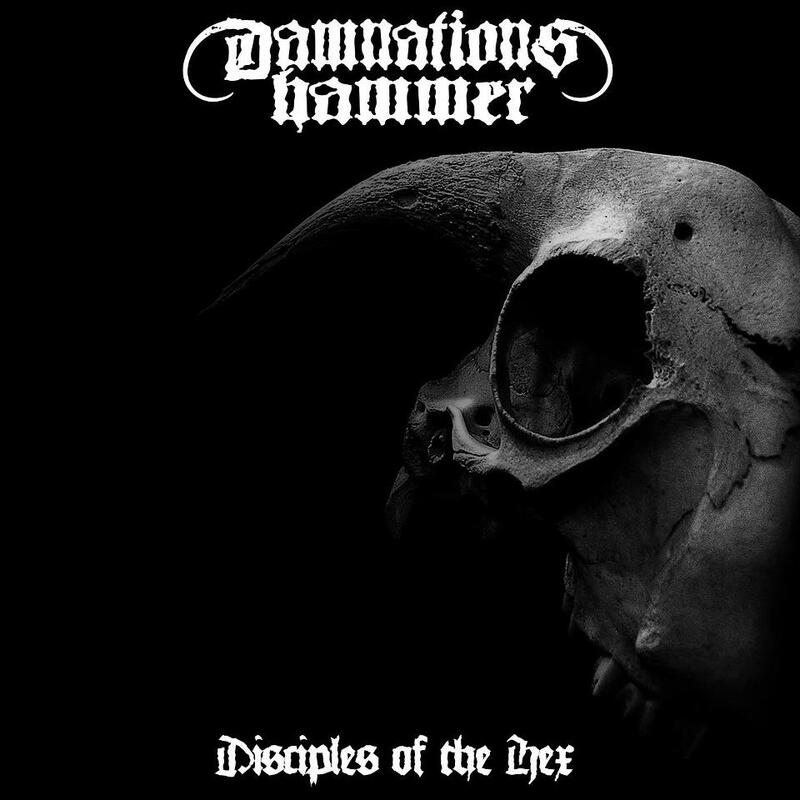 Jayaprakash Satyamuthy reviews the first full length from Damnations Hammer titled Disciples of the Hex, released via I Hate Records. With a band insignia that bears more than a passing resemblance to the cover of Morbid Tales, lurching riffs in the best ‘Procreation (Of The Wicked)’/’Dethroned Emperor’ manner and vocals that are reminiscent of Thomas Fischer circa ‘Monotheist’, it’s clear what one of Damnations Hammer’s chief influences is (yes, the name is officially ‘Damnations Hammer’ and that missing apostrophe bothers me a fair bit). Although described as ‘doom/death’, Damnations Hammer’s sound is really more doom/thrash, capturing the chug of the more brooding, dark aspects of the 80s extreme metal – basically a lot of Celtic Frost, maybe a touch of Venom and some Black Sabbath. 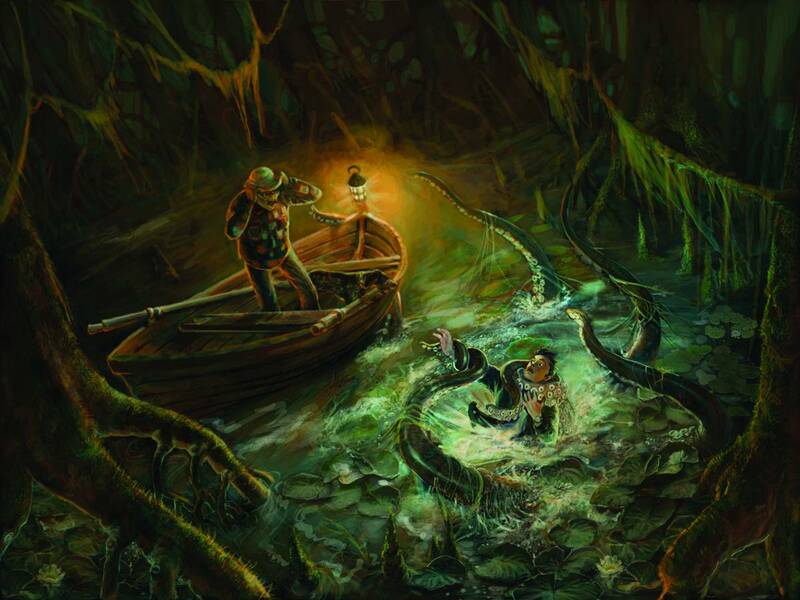 The subject matter appears to draw largely on hoary sword and sorcery standbys, and I’m not complaining, as songs like ‘Throne of Fire’ pummel out a barbaric narrative with straightforward, menacing riffs and raw, authoritative vocals that everyone’s favourite Cimmerian savage would probably have listened to with a wild delight. It’s not the most polished music around, and you don’t go looking for polish when you’re invoking this kind of mood. The more doomy riffs provide a great offset to the mid-tempo thrashy lurching, sealing the deal with an ominous, almost crude yet totally effective evocation of the uncanny and sinister and one can see why I Hate picked up this originally self-released debut for a 2013 re-release. The title track, which now has a music video, is another groovy, memorable slab of purposefully primitive metal, all chug-and-release and doomy bridges, together with a chorus that is laughably simple and irresistibly catchy. The lead guitar presence evokes the mad squall of Fischer’s flailing solos, but with perhaps a shade more control over note choice. An atmospheric spoken-word passage takes us deeper into the crypts before the palm muted guitars pick up the thread again. This feels a lot like Morbid Tales meets Monotheist, and the combination works rather well. The rest of the tracks follow in pretty much the same direction, with the exception of the weird, Gothic atmospherics of ‘The Hex ii’. How much you enjoy this will depend on how open you are to about 41 minutes of chugging, mid-tempo metal music with a lot of ominous atmosphere but not much melodic relief, instrumental virtuosity or compositional variety to inject contrasts or highlights into the journey. I like the style this band has carved out, and they are frequently very successful in conjuring an eldritch atmosphere, but I do hope their future albums see them expanding a little bit, either stylistically or in their arrangements. In the meantime, at the very least, they’re a welcome contrast to the Black Sabbath Mk. I or OSDM cloning that seems to prevail in the retro metal scene.